A peaceful late afternoon in the Westmoreland business district was disrupted on Tuesday, February 26, when a black four-door Hyundai, apparently southbound on S.E. Milwaukie Avenue, suddenly swerved, jumped the curb, mowed down a street sign, and bumped into a building. The damage appeared to be minor to the Clogs 'N More store at 6809 S.E. Milwaukie Avenue. "The driver got out of the car, but she was looking rather shaken," said BEE reader Henrik Bothe, who snapped a photo of the accident. 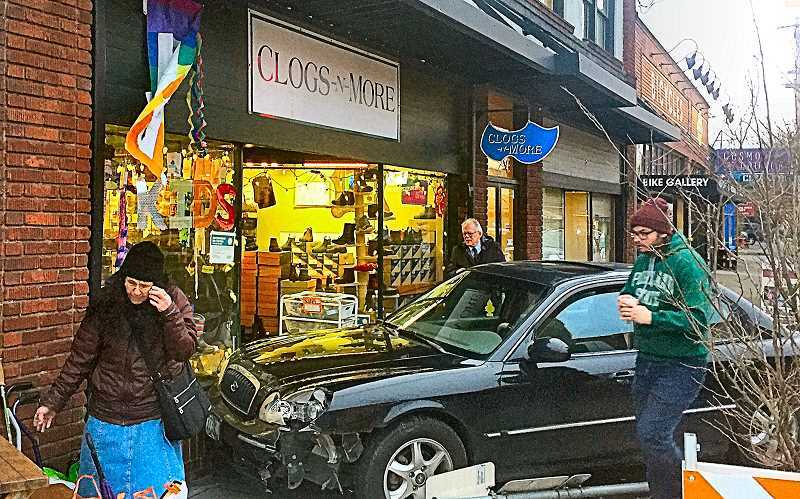 "She said she was okay when I asked, and said her foot slipped off the brake pedal." No one was injured in the mishap; the car was eventually removed by a tow truck, and no motor vehicle accident report was filed regarding this incident.